? 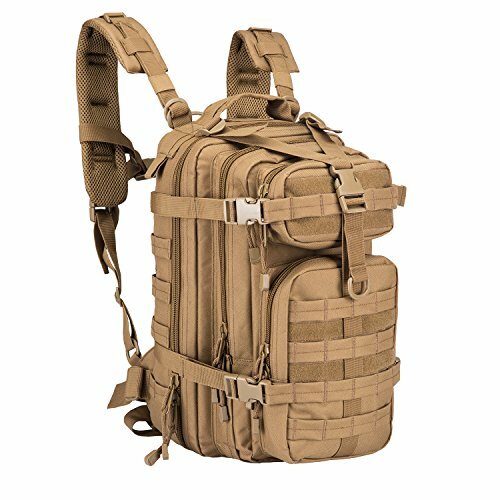 Introducing ARMYCAMOUSA Small Military Tactical Backpack ? You will have a place for everything and don't have to worry about just throwing it all in the center pouch. Everything will be organized and have its own place.
? It is completely versatile for any backpack situation.You don’t really need a huge backpack on your shoulders making it impossible to carry around and enjoy nature. You need a compact and lightweight backpack that has more than enough space for all your valuable gear.
? all your precious belongings in a backpack suitable for the outdoors!
? Love it or your money back. We are confident that you will love your backpack but if you are not satisfied, our products are always backed by 100% Money Back No Questions Asked Guaranteed! 1. Crafted with the highest-grade polyester fabric, our military backpack is relatively small in size (16.5 x 11 x 9 inches) which is what makes it perfect for your traveling, hiking or camping needs. 3. with a capacity of 34L, you’ll be able to take your outdoor and emergency equipment with you, everywhere you go! 4. Reversible zippers to keep out the dust and dirt,double stitched seams and durable, snag-free zippers, built to last for an entire lifetime. 5. Equipped with a mesh padding back area and heavily padded shoulder straps.